Corflute A-Frame, A Frame can be re-skinned each time you need to change your message. This Corflute A Frame sign has a snap-lock hinged sides which allow quick and easy changing of Corflute posters. Repeat your message or have two different designs to attract customers. Corflute A Frame Signs is relatively cheap to your poster, simply order a new poster and insert unlike its metal skinned cousin which has to be re-skinned each time you need to change your message. BPP provides customised Online Printing Services linked to our hubs located in Sydney, Melbourne, Adelaide, Perth, Brisbane. The Corflute A frame includes two Corflute Boards printed at standard resolution (720dpi) and is both UV and water resistant. This handy A Frame Signs Outdoor has snap-top hinge which allows quick and easy changing of Corflute posters. Repeat your message or have two different designs to attract customers. A Frames work more than just highlighting a few words or picture of products. They show you are open for business and ready to serve. Next time your down the street, take a conscious thought of if you entered the restaurant with an A Frame signs chalkboard or the one that didn't have one outside. 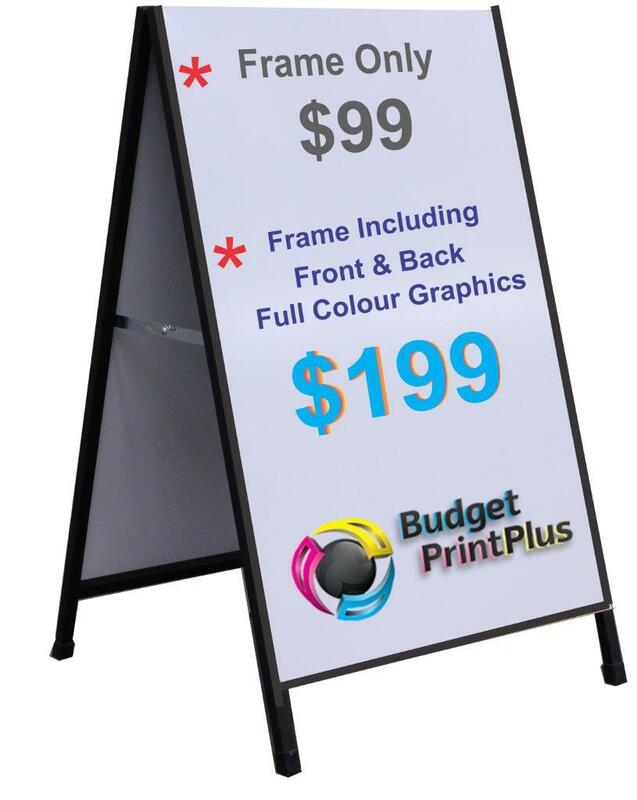 Cheap A frame Signs, send all your agents or distributors an A Frame with your header and their message. These frames will return the sign cost very quickly. Great quantity discounts are available, Buy Direct and Save. If you send just one sign... Your sales will increase. This is how powerful signage can be. Always returning results, no customer in over 10 years has commented the sign was a dead loss. Try saying that with other advertising techniques. Ever thought why Television Stations, Radio Stations, Newspaper, Magazines use so many signs?